So far in 2013, two established names have come away victorious worldwide in Dustin Johnson and Louis Oosthuizen, and while Russell Henley isn’t at that level yet, the rookie from Georgia made quite an impression on the golf world by winning Sunday at the 2013 Sony Open. Unfortunately for Langley, the momentum on Sunday only seemed to continue for Henley. Langley opened the final round with a bogey on the first, while Henley birdied. Langley bogeyed the 7th, and despite birdies on 9 and 10, he just never seemed to get it going. Tim Clark, who played the final round with the two rookies, was on fire all day, but couldn’t catch Henley. When the group made their way to 17, Clark drained a birdie putt to get within two shots, but Henley matched him, and the look on Clark’s face was priceless. Clark knew he threw everything he could at Henley, but it didn’t matter. Pure shot after pure shot, and incredible putting made catching Henley nearly impossible. Henley would go on to birdie the 18th, firing a final round 63 and picking up his first career PGA Tour win. Henley’s approach into the 16th green after a horrendous drive was the type of shot that you don’t expect to see out of a rookie. He was actually so far left off the tee that he almost went out of bounds. Being in Hawaii, Henley’s only shot to get the ball near the green was to go real high over the palm trees. He stuck it within twelve feet, and calmly drained the birdie putt. Henley became the first rookie to win his first start on the PGA Tour since Garrett Willis won the 2001 Tucson Open. This victory for Henley was no fluke. The 23-year old was a standout at the University of Georgia, and he does have three Web.com Tour victories under his belt, including two last season. Everyone knew he was going to have success on the PGA Tour, but no one expected it to come this fast. 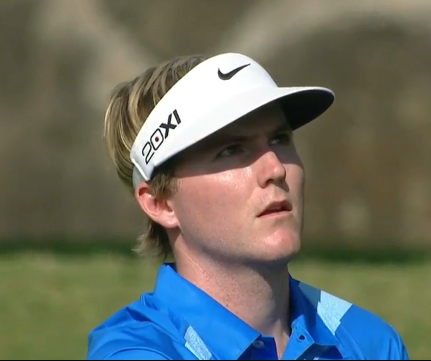 What struck me most about Henley originally watching him on Thursday was his resemblance to Brandt Snedeker. Not only does Henley look like him, but he plays like him too. The short, quick practice putts, his mannerisms and how fast he plays are hallmarks of Snedeker’s game. Henley’s been on fire too. He actually hasn’t had a round over par since September 21st, 2012, a run of 20 consecutive under par rounds. The win also gives Henley a two-year exemption on the PGA Tour, and an invite to this year’s Masters. Good Australian accent Johnny Miller what a tool. He was mistaken for Aussie golfer Cameron Percy, and while Brenton might be letting him off the hook, he really shouldn’t be. First off, he should know that Piercy isn’t Australian, but even if he was, what’s the deal with the accent? Also from Miller this week, he and Gary Koch wondered on the air why South Africa’s Rory Sabbatini wasn’t playing on the European Tour’s stop this week, the Volvo Golf Champions, since the tournament was being held in Sabbatini’s homeland. Of course, the Volvo is much like the PGA’s Hyundai Tournament of Champions in that it’s an exclusive field event, based on last year’s winners and those who have ten European Tour victories. Miller’s been accused in the past of not knowing enough about the global game, and this certainly falls into that category. I doubt that it’ll get lost in the shuffle, but Tim Clark’s week was phenomenal, especially his final round 63. When I suggested him as an each-way bet this week, I didn’t think he’d go as low as 20-under par. If he’s finally healthy, he’s someone to watch this season. He only has one win on the PGA Tour, but this was his 11th runner-up. Between Henley, Chris Kirk and Harris English, there were three University of Georgia Bulldogs inside the top-10 this week. The human ATM machine, Matt Kuchar, picked up a T-5. The next PGA Tour stop will be the Humana Challenge, getting underway on Thursday morning.